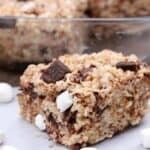 Thick, soft and gooey rice krispie treats with chunks of chocolate and marshmallow! Grease a 9x13'' pan for regular size rice krispie treats, or a 8x8'' pan for extra thick rice crispy treats. Measure cereal into a giant mixing bowl. Chop chocolate bar into large chunks and set aside. Place butter in a large saucepan and melt over medium-low heat. Once melted, add 4 heaping cups of miniature marshmallows. Stir constantly until marshmallows are melted and mixture is smooth. Remove from heat. Pour in remaining heaping cup of marshmallows and mix once or twice to combine (you don't want these marshmallows to melt). Pour the marshmallow mixture over the cereal and begin to stir to combine. Add the chocolate chunks once the mixture is well coated in marshmallows. Dump mixture into greased pan and press gently into the pan. Don't press them down too much so that you have plenty of airpockets, resulting in light and fluffy rice krispie treats!